Cinco de Mayo El Grito Contest at Mariachi Bar! La Familia Cortez Restaurants will be commemorating San Antonio's 300 May 2nd - 6th throughout their restaurants. 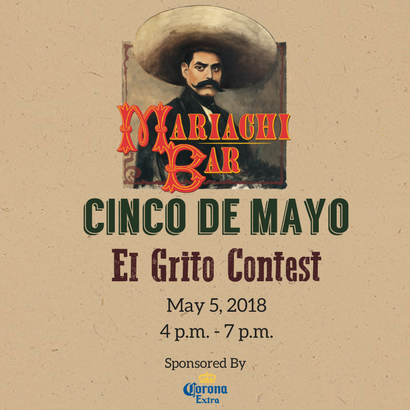 On May 5th, Mariachi Bar will be hosting "El Grito Contest" from 4 p.m. to 7 p.m. with a winner at every hour! This event is sponsored by Corona and they will be present as well! Join us to celebrate Cinco de Mayo and San Antonio's 300 for a fun fiesta night at Mariachi Bar.